In March, we reconnected with the Old 97s at their highly enjoyable set at the Capital Theatre in Portchester. So I guess it was only natural that we would attend their next NYC show, this time as a play-a-full-album three night run at Brooklyn Bowl — one of our old favorites at one of our current favorite venues. The first night album was appropriately the band’s first album Hitchhike to Rhome played from start to finish, including a bonus track, a hidden track, and even an outtake from the album’s sessions. At the conclusion of Rhome, the Old 97s played another dozen tracks, making this both an lengthy and highly entertaining set. The band’s performance was both inspired and tight — clearly a band comfortable with their past and their present. I recorded this set with the Sennheiser MKH-8040 cards pointed at the right stack midway on the right side of the floor. The ambient noise (bowling and chatter) is greatly reduced with the addition of a board feed, synced in at about 40% of the overall mix. The result is a superb recording. Enjoy! 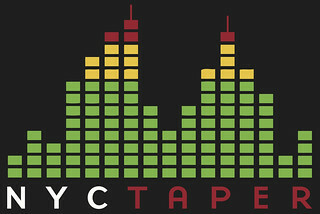 If you download this recording from NYCTaper, we expect that you will PLEASE SUPPORT Old 97s, visit their website, purchase their official releases from the Store at their website [HERE]. Awesome! Thank you! Love this band. Seen them live so many times. Thanks a lot for this recording. Did you also tape Trapper Schoepp and the Shades? I enjoyed their set very much. Yes, Trapper was excellent. And yes, the set was recorded and is coming soon. Outstanding recording. Wish I could have been there. thanks! This was my birthday and I wanted to go so bad, but I didn’t have a car or a ride. I was stuck in a hotel in North Jersey. What a great birthday! Many thanks. They don’t seem to come to Atlanta or Athens GA anymore. So sad. Thank you for this MP3 offering.. The Old 97’s are one of the best live bands I’ve seen in many years….and I’ve seen hundreds of bands. Uncle Tupelo followers would like these guys. Grab a cold one and crank it. One of the best live bands ever! Thank you for this recording. Thanks, seriously thanks! Realized there is a total lack of any really great recordings of the band, at least in my collection. To have this one, an album show in entirety is special. Great capture! Thanks for this. My favorite band–so great live!